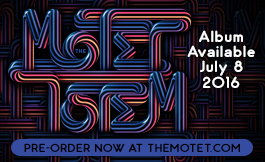 Every Tuesday from now until our Red Rocks show on 7/22, we’ll be posting our new video series, Conversations with The Motet. Tune in to hear us talking about our instruments, our musical influences, and our new album Totem. Each weekly video will feature a track from Totem, so be sure to check back as more episodes in the series are released! Props to Punching Mule for helping make this video series possible!